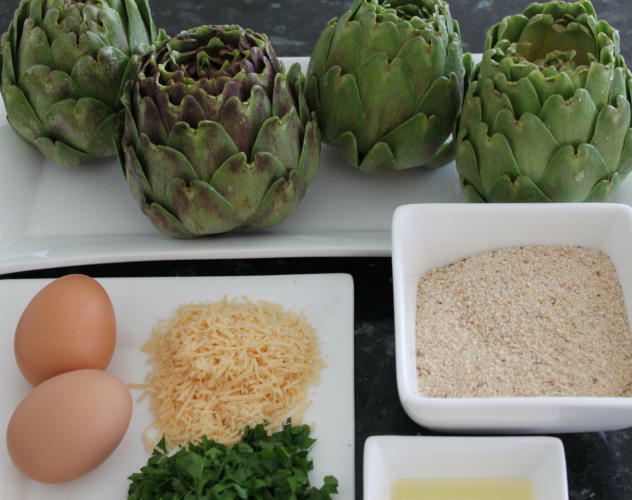 The globe artichoke may be a little time consuming and troublesome to prepare, but it is definitely well worth any effort. Not only do they have a unique, delicious flavour but their health benefits are numerous. 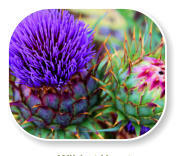 The globe artichokes’ health properties have been known and used medicinally for centuries, and yet it is a shame that modern society is eager to purchase over the counter vitamins and supplements rather than educating themselves in the power of natural vitamins in fresh fruit and vegetables. When preparing the globe artichoke to cook the whole globe, cut off the stem at the base of the artichoke but do not discard. The stem is not only very tasty but also packed with vitamins. 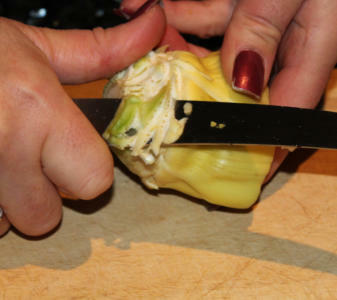 Do not peel the stem until you are ready to add it to your pot, otherwise it will turn brown. .
Slightly spread all the leaves around the artichoke globe starting from the outside to the inner, then rinse under a running tap. Stand upside down on the sink or a paper towel to drain. 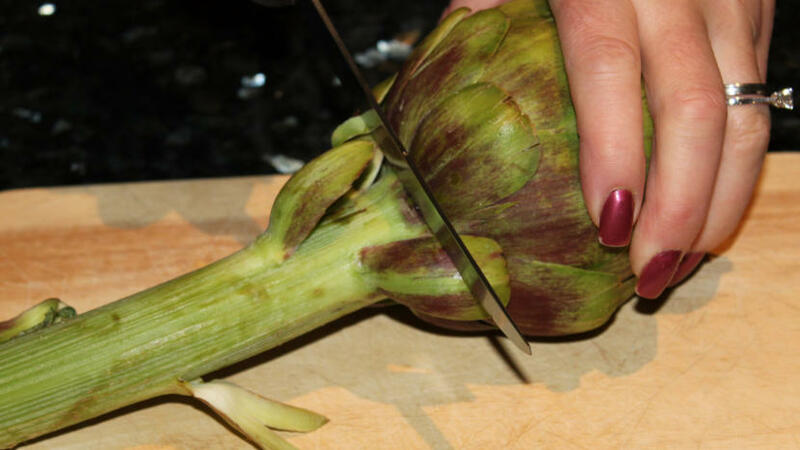 Once you have prepared your artichoke either for stuffing, steaming or baking, peel the stem with a knife removing the thick, stringy outer membrane and cut into 6-8cm pieces. 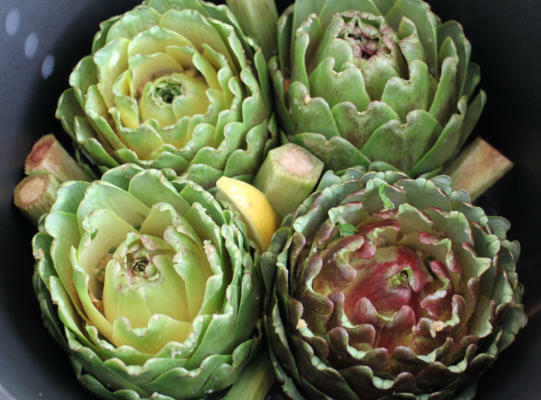 Add the stems to the pot or tray with your artichokes ready for cooking. 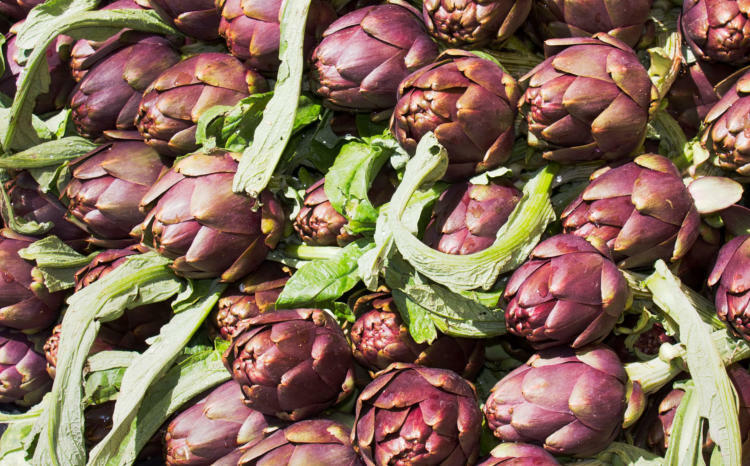 Whether you boil, steam or bake your artichoke globes, the cooking time will depend on the season it was harvested. It will be cooked when one of the bracts detaches easily from the globe once you tug at it. Preparing artichokes hearts is not difficult. 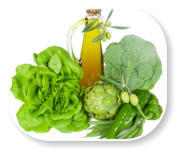 They can be prepared in advance, refrigerated and used when required. 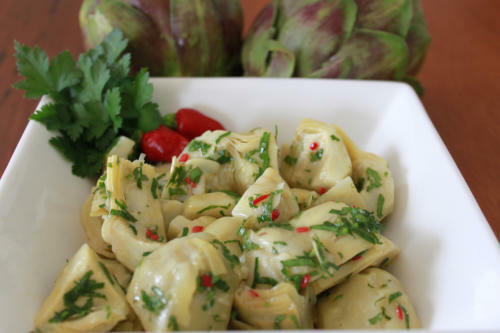 Once prepared the artichoke hearts can be used in your favourite dishes including pastas, risottos, salads or pizza toppings. 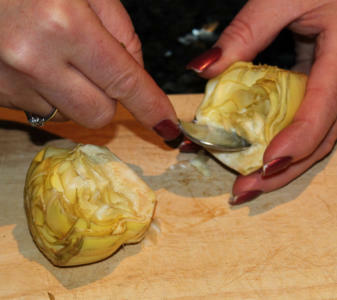 When preparing globe artichoke hearts always have a bowl of 1 litre water with juice from 1 lemon to submerge them while preparing the remaining hearts. This will avoid any discolouration. 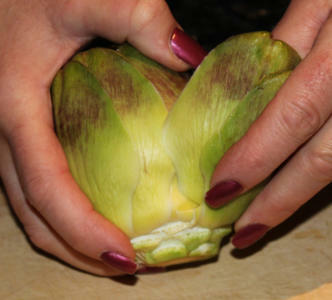 To prepare the globe artichoke hearts using large globes; cut off the stem at the base of the globe and pull off the outer, tougher bracts. 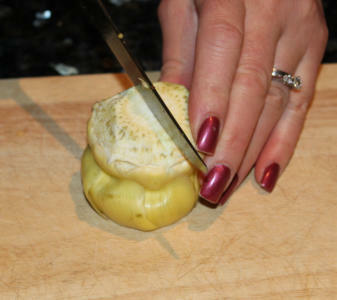 When you reach the tender bracts, cut off the tips, then trim the base removing the tougher areas and making it smooth. 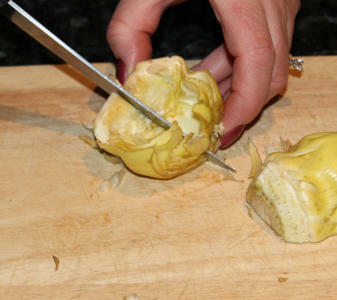 Cut the globe artichoke heart in half. Scoop out the fuzzy, hairy choke (if any) with a teaspoon or knife. 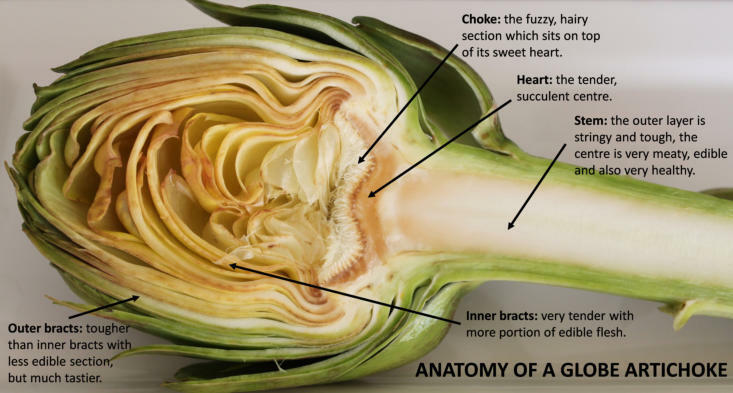 The hairy chokes sits just on top of the globe artichoke’s heart. Again, the amount, size and toughness of hairy matter depends on how mature the globe artichoke is and in which season it was picked. If the hearts are large, cut the heart in half again (quartered now) otherwise leave them halved (or even whole if really small). Submerge the prepared hearts in the water with lemon juice. Continue to prepare the remaining globe artichoke hearts. Note: There may still be a slight discolouration in the heart while preparing the remaining hearts, but once they are cooked in the water and lemon juice, it will disappear. 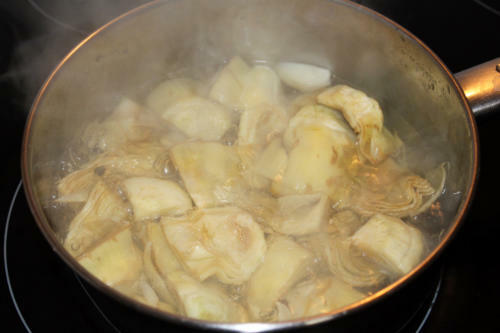 Once all artichoke hearts have been prepared and placed in water & lemon mixture, they need to be cooked. Instructions for this method are below. 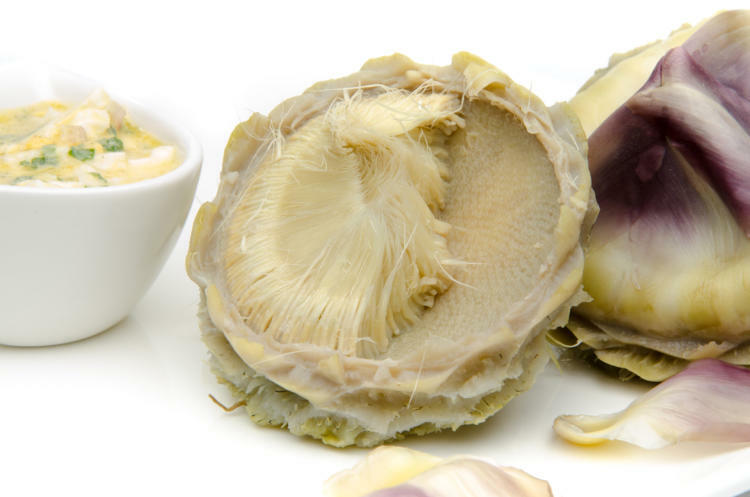 Ingredients: 2 cups water, 2 tablespoons lemon juice Hearts from 4 globe artichokes Method: 1. Bring water and lemon juice to the boil. 2. 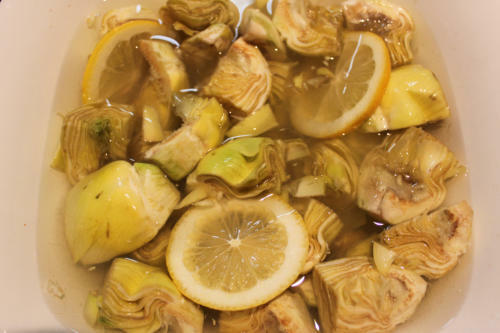 Drain artichoke hearts and add to the boiled water and lemon juice. Bring mixture back to the boil. Lower heat and cook for 1-2 minutes until tender but firm. 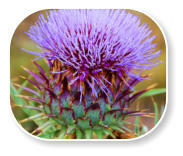 The amount of cooking time will depend on the maturity of the globe artichoke or the season it was picked in. 3. Remove from heat and drain. Place in iced water to cool quickly and stop the cooking process. 4. Place on paper towels to dry. Once dry, they can be place in the freezer for later use, or kept in the fridge for a few days to be added to your favourite dishes. They can also be marinated with oil, parsley, lemon juice, salt & pepper and chilli to enhance their flavour and used as an antipasto. There are only two sections of the artichoke which should be discarded. They are the top one-third to half of the outer bracts (depending how close the bracts are to the outside of the globe) and the hairy choke which sits just on top of its tender heart. The amount of fuzzy, hairy matter depends on how mature the globe artichoke was when picked, or which month it was picked; early, mid or late in the season. 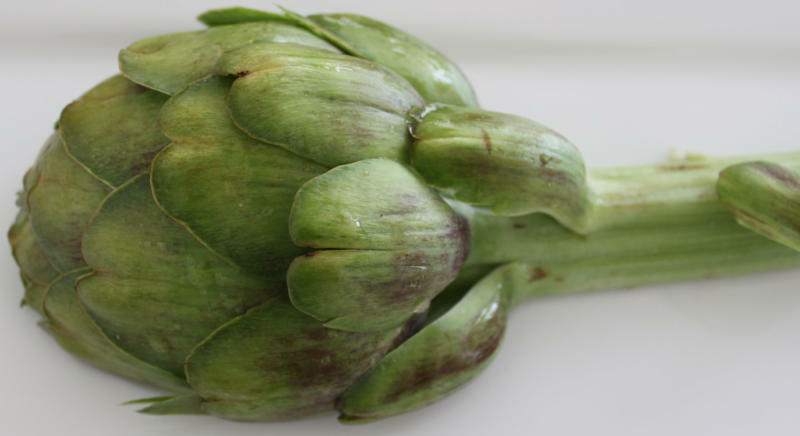 However, if the artichoke was harvested in peak season, the hairy choke becomes very soft when cooked and there should be only a minimal amount. 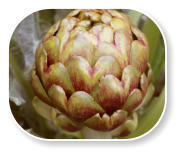 Globe artichokes are tasty when stuffed and steamed or baked. This method is ideal if wanting to consume most of the artichoke. 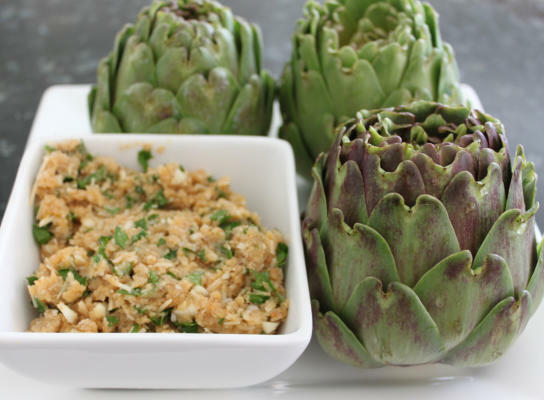 It’s a waste to eat just the hearts and discard the remaining parts as nearly all the artichoke is edible and all parts contain excellent health properties. Stuffed globe artichokes with breadcrumbs, parmesan and parsley is an old Italian recipe which has been passed down in my family for generations. This is more time consuming but certainly worth the time spent. 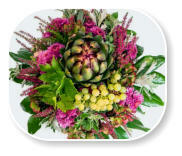 Once stuffed, some steam them in a pot along with the prepared stems, while others prefer to bake the globes in a tray. 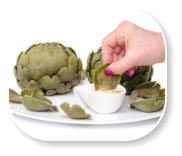 Artichokes are also very tasty when steamed or baked whole without stuffing, then the bracts are dipped in vinaigrette. Both recipe links are below. 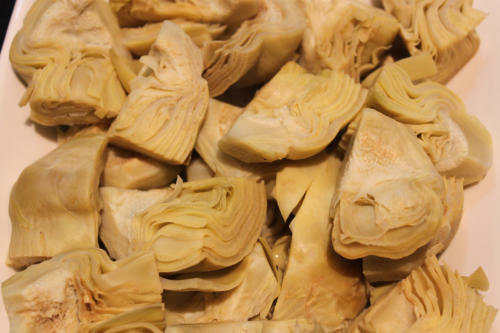 Preserved artichoke hearts are usually prepared from baby artichokes. These are generally harvested at the end of the season as farmers pick small globes remaining on the plant which they do not expect to grow to full size. Picklers (baby artichokes) are very tender and with a little trimming and cleaning almost the whole bud can be cooked. Although the outer leaves are tougher the edible flesh is more flavoursome them those closer to the centre. At the centre, the bracts are tenderer and almost all edible.